Medieval Morsels: Buckets of eels, eels in pies and eels "reversed"
Eels were commonplace in rivers and thus a popular food for the taking in Medieval times. In fact there is ample evidence that they were fished, or indeed I think we can say farmed, for centuries beforehand in Egyptian and even earlier civilisations. Eel traps woven from flexible willow strands are familiar to archaeologists throughout the world. In Medieval towns, eels like other fish were kept in “stew ponds” until required for the table. For obvious reasons carniverous (meat eating) pike, eels, and tench were kept in separate ponds from less feisty and flesh friendly fish - carp, bream, perch etc. Otherwise pretty empty stew ponds would result! In the early Middle Ages the "canny" Holy Roman Emperor and King of France Charlemagne (742-814) ordered stew ponds for pike, eels and tench to be made on all his estates. The proceeds raised swelled the imperial treasury’s money chests! The King’s Pike Ponds at Southwark on the south side of the Thames supplied the English Royal table. The moat of the Tower of London was also used for fish production. 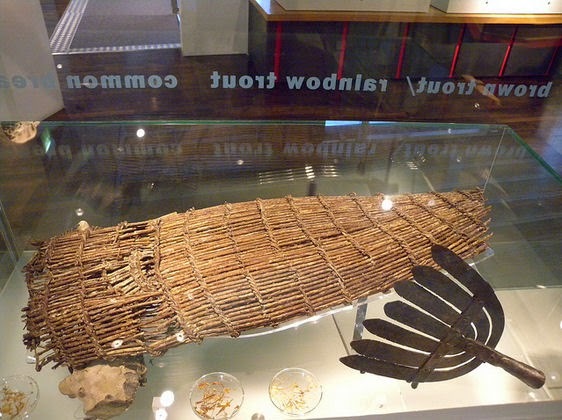 Take a look at this eel trap found there, now on display in the Museum of London. At one time in the English countryside willow eel traps were such a common sight on rivers that laws had to be passed to limit their numbers. Some historians suggest that whoever wrote the paragraph in the Magna Carta mentioning ‘fish weirs’ probably meant eel traps! Eels are opportunistic nocturnal carnivores, scavenging on dead meat. This meant traps could be baited with whatever carcass, tainted fish or meat was to hand. A pleasing haul of live eels was practically guaranteed when the trap was lifted! The colours of eels vary widely with the bottom on which they live. MedievalMorsels’ dark eels for a 12th scale Medieval or Tudor dolls house or gothic/rustic setting are typical of the dark, putrid mud of the medieval River Thames, where so much discarded meat was thrown by butchers, along with animal carcasses. And let us hope hapless human beings did not end up in London's Thames as well. One inch scale medieval dolls house food -a bucket of eels! An intriguing French 13th century recipes is for “eels reversed”. Skinned and de-boned, then sliced lengthwise and flattened into long rectangles, they were then filled with a mixture of meat and spices and sewn back together, inside out. The eel is then cooked and served. Eels are very rich in fat, but smoked they proved a bit more digestible. But a fatty fish would be a welcome addition to the medieval diet, served as a stew or in a pie! Especially during meat-free Lent. Overindulgence would probably lead to indigestion, or, if tainted, to food poisoning. In fact folklore has it that two Kings of England fell prey to over-eating, not eels but lampreys. Similar looking, they are probably highly fatty too. Lampreys are fodder for a post another day! I have eaten smoked eel, probably locally sourced, at a "guinguette" or dancehall on the River Seine beyond Paris. They tasted just like aged, smoked trout- very pleasant indeed. The European eel, Anguilla anguilla, is born and dies in the ocean, spawning in the Sargasso Sea. But it lives in freshwater for most of its life. 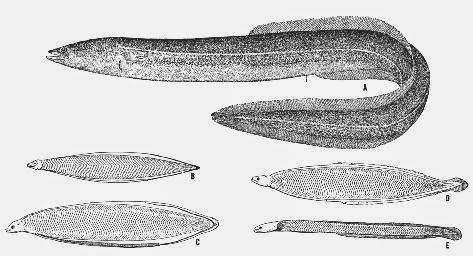 Unbeknown to Medieval peasants who simply farmed or ate them, European eels have a complex life history and were exploited in most life stages. Those that were fished did not have the chance to breed. No surprise then, that their numbers - very numerous in the Middle Ages - have dwindled drastically in modern times. In England the eel is now officially a critically endangered species! A sad reversal of fortune for the eel. Its the same story for the formerly numerous guinguettes on the River Seine.